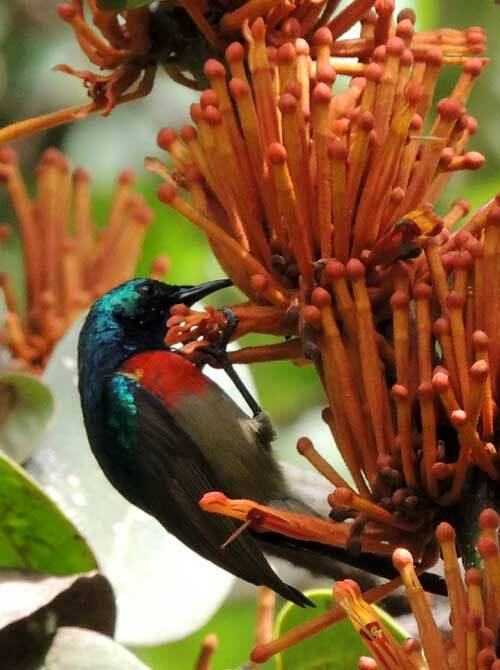 The male Double Collared Sunbird is visiting flowers of a parasitic plant, Phragmanthera sp.. Kitale, Kenya. April 2013. Kenya has 33 species of sunbirds many of which can be difficult to identify due to color variations and the fact that the irridescent feathers take on different shades depending on the direction of light relative to the observer. The bird shown at left, is, I believe, the Eastern Double Collared Sunbird. The Northern Double-collared Sunbird is similar; it has a wider red band. 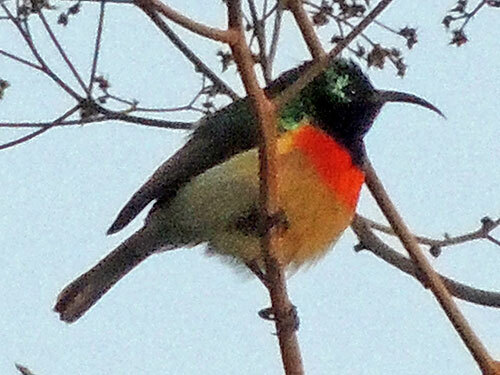 This observation is more clearly a male Eastern Double-Collared Sunbird. Observed in gardens near a water hole, Abedares National Park, Kenya. June 2017. 15 Days Birding Adenture in Kenya! See 350 to 500 Species!! !